What is the difference between a thundershower and a thunderstorm? What are my chances of being struck by lightning? What should I do if I'm caught out in the open during a thunderstorm and no shelter is nearby? Shouldn't I lie flat on the ground to get as low as possible? How do I avoid having to use the Lightning Crouch? Does lightning travel from the cloud to the ground, or from the ground to the cloud? If lightning travels from the ground into the cloud, why do photographs show branches of lightning descending from the cloud? How far away from the storm center can lightning strike? Can lightning strike me while I'm indoors? Can I use my cell phone or cordless phone during a storm? Can I be struck by lightning if I wear rubber soled shoes? I am in a boat on the open water. How can I protect myself from lightning? 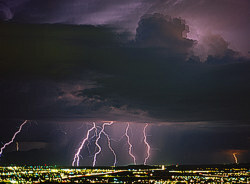 Should I install a lightning protection system on my home or business? Lightning struck the pole and traveled down the flag to the golf green. The bolt then branched out along the ground leaving dead grass as an indicator of the ground current. Technically, there is none. In general, the term "thundershower" tends to denote a fairly weak storm with light to moderate rainfall and low levels of lightning activity. 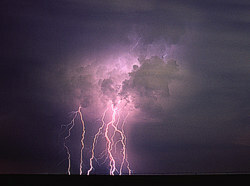 However, there are no defined parameters that distinguish between a thundershower and a thunderstorm. Where there is a lot of lightning, there is an increased chance of being struck. The central Florida peninsula from Tampa Bay to Cape Canaveral has the highest lightning concentration in the United States. More than 90% of the lightning in this area occurs between May and October, between the hours of noon and midnight. During this time of day and year, people in Central Florida who spend a large portion of their lives outdoors (e.g. construction workers, park rangers, golfers, campers etc.) are more likely to be struck than anywhere else in the country. On the other hand, thunderstorms are uncommon in the Pacific northwest, and are virtually unheard of during the winter months. People in this region who spend much of their lives indoors (e.g. shopkeepers, librarians, bowlers, billiard players, etc.) might win the lottery before they were struck by lightning. It is impossible to assign one single probability to every person in every situation. There are NO SAFE PLACES outdoors during a lightning storm. Don't kid yourself--you are NOT safe outside. Following these tips will not prevent you from being struck by lightning, but may slightly lessen the odds. If camping, hiking, etc., far from a safe vehicle or building, avoid open fields, the top of a hill or a ridge top. Keep your site away from tall, isolated trees or other tall objects. If you are in a forest, stay near a lower stand of trees. If you are camping in an open area, set up camp in a valley, ravine or other low area. Remember, a tent offers NO protection from lightning. If you are camping and your vehicle is nearby, run to it before the storm arrives. Stay away from water, wet items such as ropes and metal objects, such as fences and poles. Water and metal are excellent conductors of electricity. The current from a lightning flash will easily travel for long distances. Lightning struck and traveled down the flag of a golf green. The bolt then branched out along the ground leaving dead grass as an indicator of the ground current. NO! Lying flat on the ground was once thought to be the best course of action, but this advice is now decades out of date. 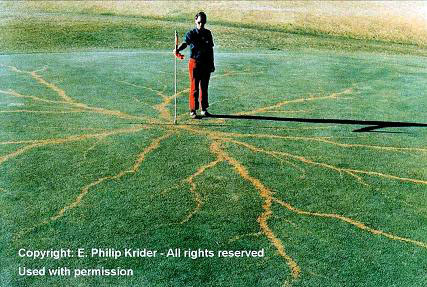 When lightning strikes the earth, it branches out along the ground. The lightning bolt can be fatal up to 100 feet away from the point of strike. These currents fan out from the strike center in a tendril pattern, so in order to minimize your chance of being struck, you have to minimize BOTH your height AND your body's contact with the earth's surface. We don't recommend the crouch because it will not significantly lower your risk of being killed or injured from a nearby lightning strike. Be aware of your situation and PLAN AHEAD. If you going to be involved in an outdoor activity, make sure you know what the forecast is, ESPECIALLY if you live in a lightning prone area. If storms are forecast, have a plan of action that you can enact quickly to reduce your chances of being struck. An entire lightning strike employs both upward and downward moving forces. However, the return stroke of a lightning bolt travels FROM THE GROUND INTO THE CLOUD and accounts for more that 99% of the luminosity of a lightning strike. What we SEE as lightning does indeed travel from the ground into the cloud. In photographs, it may APPEAR that lightning is descending from the cloud to the ground, but in reality, the return stroke is so brilliant that as it travels up the strike channel, it illuminates all of the branches of the stepped leader that did not connect with a streamer. Almost all lightning will occur within 10 miles of its parent thunderstorm, but it CAN strike much farther than that. Lightning detection equipment has confirmed bolts striking almost 50 miles away. YES! If a bolt strikes your house or a nearby power line, it CAN travel into your house through the plumbing or the electric wiring! If you are using any electrical appliances or plumbing fixtures (INCLUDING telephones and computers), and a storm is overhead, you are putting yourself at risk! 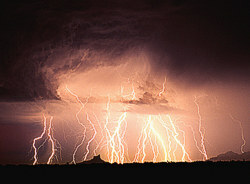 FACT: About 4-5% of people struck by lightning are struck while talking on a corded telephone. Yes. These are safe to use because there is no direct path between you and the lightning. Avoid using a corded telephone unless it's an emergency. Absolutely! While rubber is an electric insulator, it's only effective to a certain point. The average lightning bolt carries about 30,000 amps of charge, has 300 million volts of electric potential, and is about 50,000°F. Besides, the lightning bolt may just have traveled many miles through the atmosphere, which is a good insulator. Your ½" (or less) of rubber will make no difference. The vast majority of lightning injuries and deaths on boats occur on small boats with NO cabin. It is crucial to listen to weather information when you are boating. If thunderstorms are forecast, do not go out. If you are out and cannot get back to land and safety, drop anchor and get as low as possible. Large boats with cabins, especially those with lightning protection systems properly installed, or metal marine vessels are relatively safe. Remember to stay inside the cabin and away from any metal surfaces. Stay off the radio unless it is an emergency! It depends. Do you have electrically sensitive equipment and do you think your building may be struck? Contrary to some popular beliefs, lightning protection systems DO NOT prevent lightning. Instead, they actually bank on the assumption that your building will be struck. They help mitigate damage by giving the lightning a preferred pathway into the ground, not unlike a flood spillway system.